In October 2008 we had the classic Egyptian holiday with our good friend Jo -we cruised the Nile for a week then finished with four nights in Cairo. 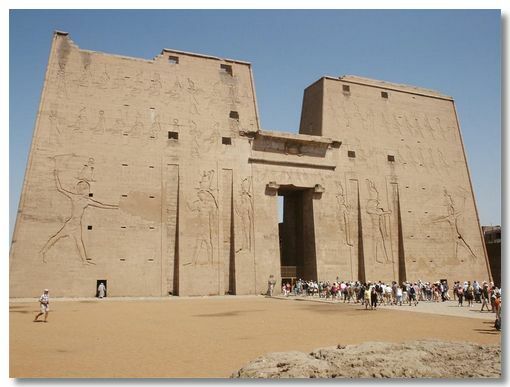 We flew into Luxor, then cruised to Aswan and back, stopping off at Edfu and Kom Ombo on the way. While at Aswan, we flew to Abu Simbel visiting its re-sited temples. 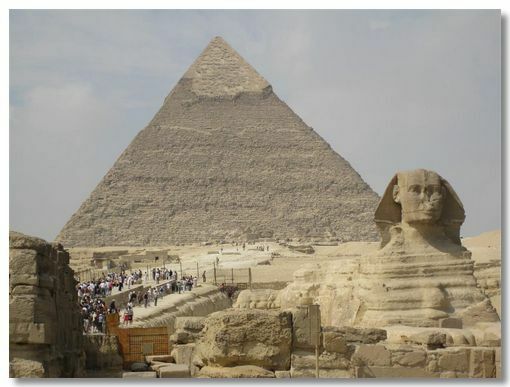 In Cairo we stayed in Giza, near to the Pyramids and Sphinx. 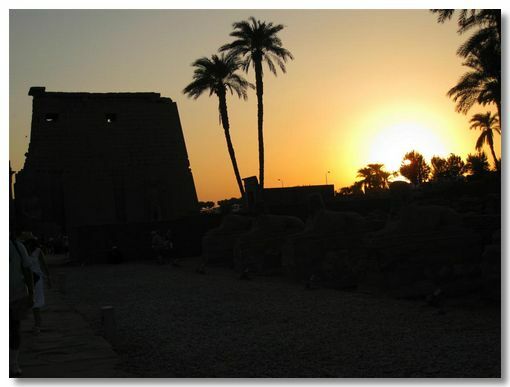 We also visited Sakkara to see the earliest Pyramids and the old capital of Memphis. In the city of Cairo itself, all we did was to visit the Archaeological Museum (twice!) and the Citadel. Ahmed at MISR Travel organised our well planned trip. The guides and services were superb. Thanks again. I have uploaded over 200 photos of our Egypt holiday. 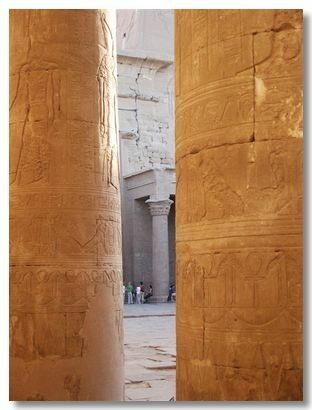 About half of them are of the fabulous ancient temples along the Nile. So if you just want to look at a few photos, the Egypt Highlights page has some of the best photos (IMHO). We had a decadent time on board the MS Sherry Boat. 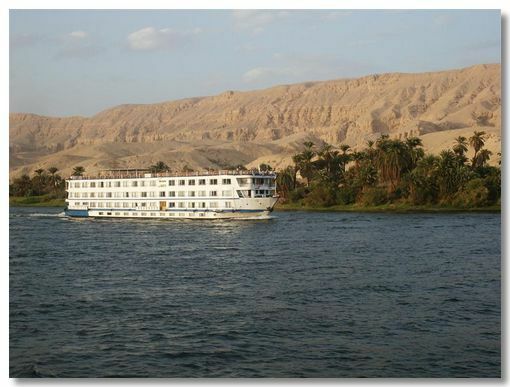 The Nile has dramatic scenery with the desert looming just beyond the narrow fertile strip on both banks. The West bank of the Nile opposite Luxor has more ancient historical sites per square yard than anywhere else in the world, let alone Egypt. 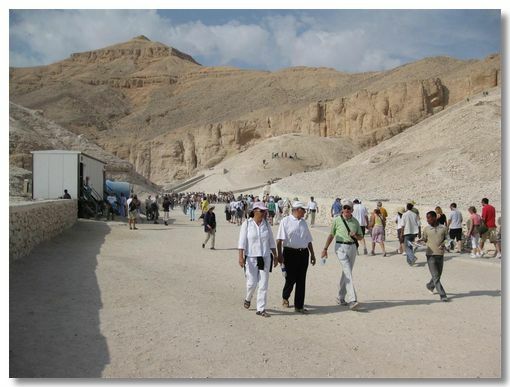 In addition to the actual Valley of the Kings with its numerous Pharaonic tombs, we visited the Colossi of Memnon, Hatshepset's Mortuary Temple, the Valley of the Nobles and the Workmen's village of Deir el Medina. If we had more time, there are many other sites we would have loved to have seen here. 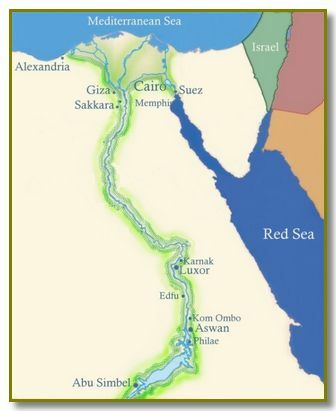 We visited six main temples along the Nile, each very different. They were built to impress on an epic scale. They didn't disappoint! They are so monstrous that I felt very small walking by them. For some four thousand years they were the tallest man made structures on the planet. Truly awe-inspiring. The Citadel has magnificent views over Cairo - air pollution permitting. 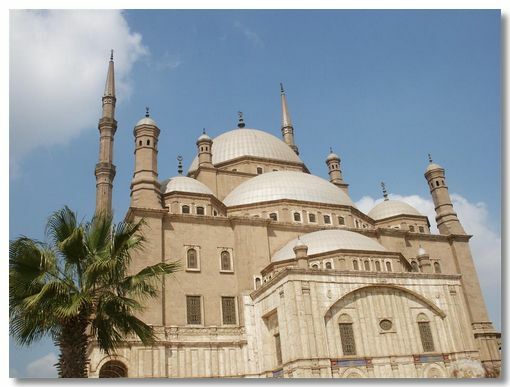 The Mohammed Ali Mosque is its dominant feature. Egypt Reflections is a collection of various photos taken while travelling round Egypt that do not fit into any of the above pages.